Ohaider everyone. It's been a while. :)) Mash is here on this fine day to review a game that was entered into one of sploder's biggest game competitions, the Epic Game Drop. Or the EGD for short. This time, I'll be reviewing a game made by a member that isn't too popular around here, but I have reviewed one of his games already. And to be honest, I wasn't too impressed with his game. But I have pretty high hopes for the game I'm gonna be reviewing today because I recall giving him some tips and advice on how he could maximize the concept he had in mind. Oh, I forgot to mention the actual game and creator. Today, Mash will be reviewing a game called Aqua Rescue by kingoffangdams. I expected the gameplay to be a little bit more fast paced, but it wasn't despite the time limit you were given. Your character didn't feel too fast either, but I honestly don't think that should matter too much though. The pace of this game would probably be around medium to slightly fast. It wasn't fast to the point where you'd be panicking, but Aqua Rescue is a pretty fun game nonetheless. But to be honest, it had some parts where the fun just suddenly died. 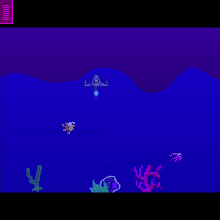 Some of the larger levels where you really had to look for the ship weren't the best levels since the rocks and sharks could be easily avoided, which kind of removed the 'thrill' of avoiding enemies in a game. I also do think that fang should have made the time a little bit shorter on some levels. I wouldn't say that Aqua Rescue is difficult though. It's just the right difficulty for everyone to play and I'm glad I was able to complete it without much difficulty. As for the placements of the game, I would say that it ranged from average to below average. At times the placement would be alright, everything is pretty much distinguishable and somewhat organized, but on some levels the placement was quite messy. Fang could've made the other moving creatures a tad bit more organized because it sort of irked me whenever I saw the schools of fish moving around in the game because as I said earlier, it felt quite messy. Also, the enemy placements could use some work since they could be avoided a little bit to easily. But compared to the placements of his game called Parallel, (One of his games that I've reviewed in the past.) I do believe that Fang has improved quite a lot and that's what matters a lot more to me. Perfection isn't something that comes by easily, so we just have to keep working hard in order to keep going forward. And who knows, we might actually attain that 'perfection' in the future if we just keep going. (What just came out of Mash's brain? And now you see what happens when Mash doesn't get her 8 hours of sleep. xD) So even though the placements of Aqua Rescue weren't the best, at least it was very evident that fang worked really hard on this game. The design of Aqua Rescue wasn't anything too impressive as well. I have a similar opinion on the design and placements of this game. They were quite messy to be completely honest. Fang could probably work on the colors and how he utilizes the things available on the PPC. What's pretty disappointing about the design of Aqua Rescue is that, Fang could've done a lot better. Though the design in the game overall wasn't too shabby, I believe that he could've done better. As for the main concept of this game, I think it's pretty creative. But, I do think that the concept could have been executed better. He could have taken more advantage of this concept and expanded it in even ore ways. But since I am a very creative person, I cannot think of ways on how he could've expanded this idea, but I do believe that it's still possible to. Aqua Rescue is a pretty creative game, but the concept could have been executed better. The design was pretty average as well. Placements were pretty much so-so. As I said earlier the concept is pretty new, but it was poorly executed. It was quite addicting, but it does become boring at some levels. The difficulty was alright. I liked how the difficulty was made so that almost everyone and anyone could complete the game. Aqua Rescue, in my opinion is an okay game. To me, it wasn't anything too special. It didn't really stand out compared to all the other games out there. But I do believe that Fang did his best to make this game for the EGD and I think that this was a good try. But, I wouldn't really deem Aqua Rescue to be feature worthy just yet. Quite a lot things in this game need to be tweaked and improved in order to make me say that this game deserves a feature. But, I'm proud of fang because he did his best, never hesitated to ask me for help and I'm glad that I was able to help him even if it was only a little bit of help in making this game a reality. Thank you all for reading my review. This is Mash, about to either sleep or do my homework... if I feel like it.